Primary Controls are the driver input devices necessary for controlling the Gas/Brake and Steering functions of a motor vehicle. The “plug and play” design of AEVIT 2.0® allows you to build your system with the input devices that fit your physical needs. If your needs should change in the future, simply plug in a different input device. All options shown are “plug-ins” and can be exchanged for different options anytime during the life of your vehicle. 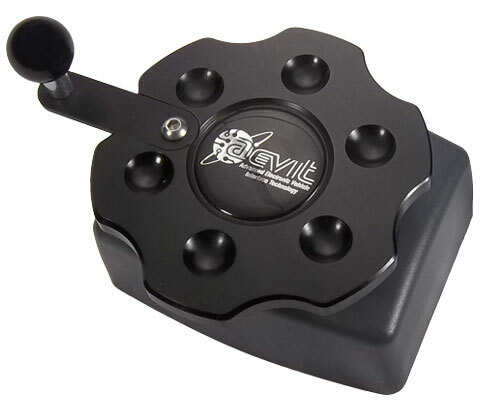 That utilizes a multi-axis joystick input device. Motion in the X-axis is for Steering and the Y-axis motion is for Gas & Brake. 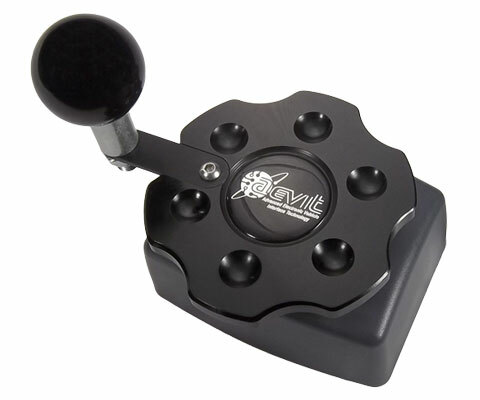 The exposed height of the joystick is approximately 4.25″ and an angular displacement, or range, of only 50 degrees is required to move the input from the full left steer position to full right steer or from the full gas position to full brake. As with all AEVIT® Gas & Brake systems, the Gas & Brake input direction can be programmed by your Dealer to be either gas forward or brake forward. The WL-Series is a Gas, Brake & Steering system that utilizes the same wheel input device as the W-Series for Steering and the same lever input device as the L-Series for Gas & Brake. 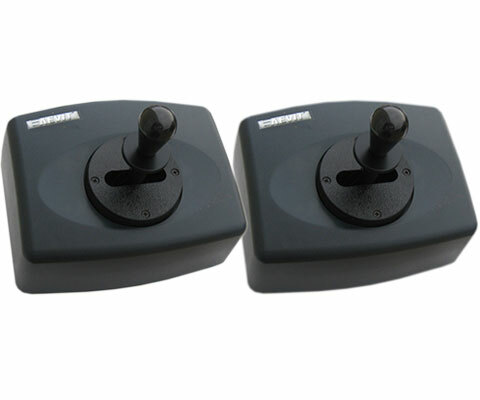 These input devices are designed to be mounted on each side/w-series/ of the driver. However, they are interchangeable so that the system can be tailored for right or left hand steering. The XL-Series is a Gas, Brake & Steering system that utilizes two separate control inputs. 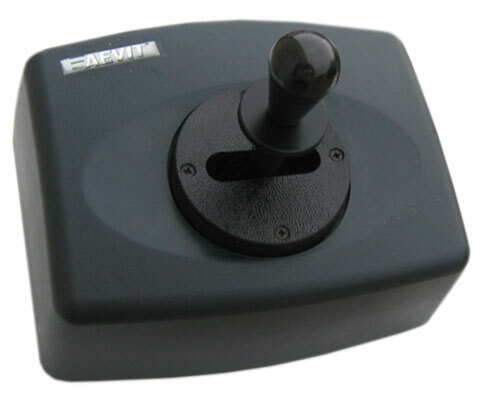 A joystick constrained to the X-axis (same as the X-Series) is used as the Steering input and a lever input device (same as the L-Series) is used for operation of the Gas & Brake. The XY-Series is a Gas, Brake & Steering system that utilizes two separate control inputs. 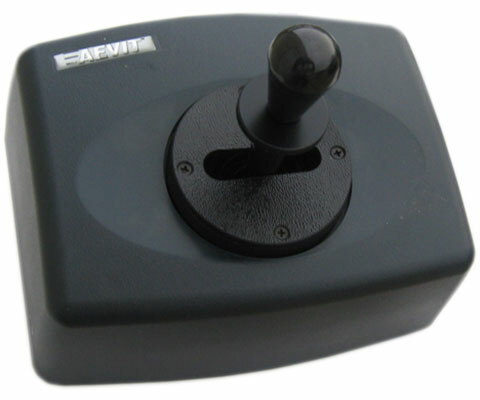 A joystick input device constrained to motion in the X-axis is used for Steering (same as the X-Series) and a separate joystick input device constrained to motion in the Y-axis is for Gas & Brake (same as the Y-Series). 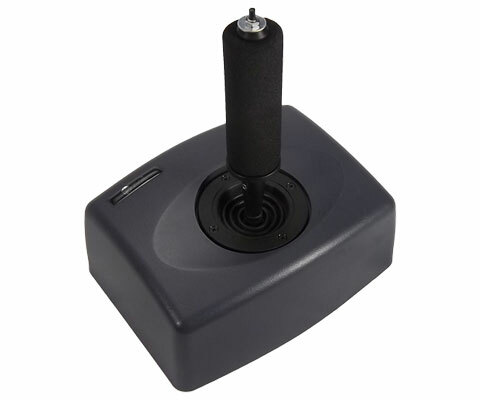 This system is well suited for persons requiring joystick control but able to utilize dual input devices. The WY-Series is a Gas, Brake & Steering system that utilizes two separate control inputs. 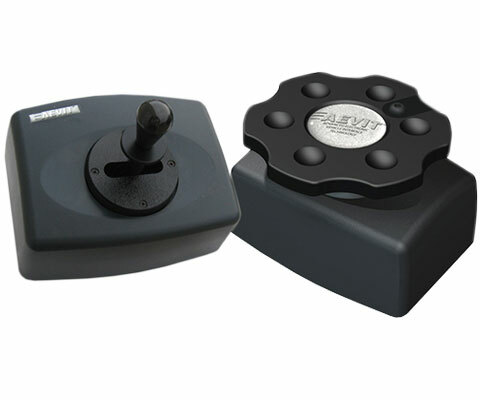 A wheel input device is provided for Steering (same as the W-Series) and a Y-axis joystick for Gas & Brake (same as the Y-Series). This system is well suited for persons requiring extremely low-effort Gas & Brake control and a miniature low-effort steering wheel. 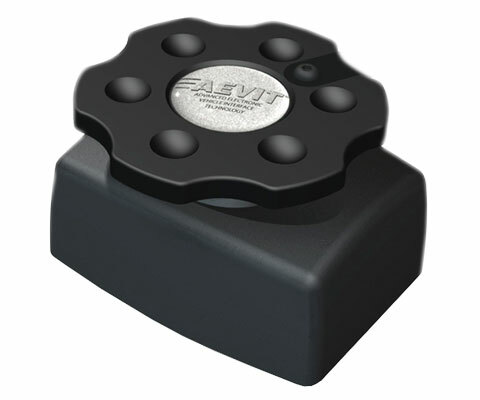 The AEVIT 2.0® L-Series is a Gas & Brake only system that utilizes a lever input device. 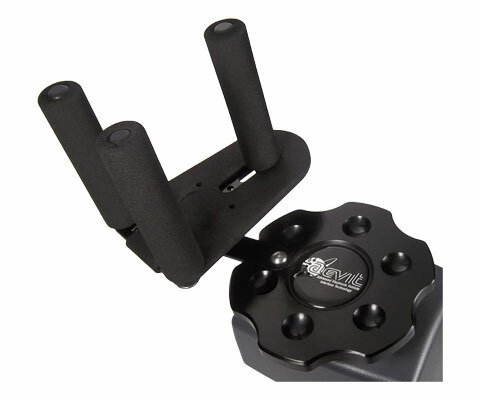 The exposed lever height is 2.5″ and the device requires a maximum input force that can be adjusted from approximately 2.4 – 5.0 lbs. The total angular displacement, or range, of the lever from the full gas position to full brake is 90 degrees. Two (2) horizontally opposed internal dampeners provide the return-to-center mechanism and produce a smooth feel that can be adjusted independently for both the Gas and Brake direction. 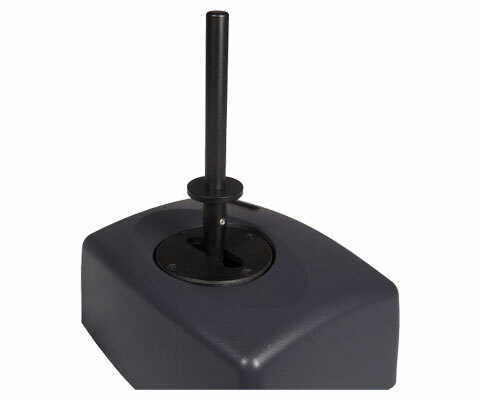 The Y-Series is a Gas & Brake only system that utilizes a single axis joystick input device. The joystick is constrained to motion only in the Y-axis, thus the nomenclature Y. 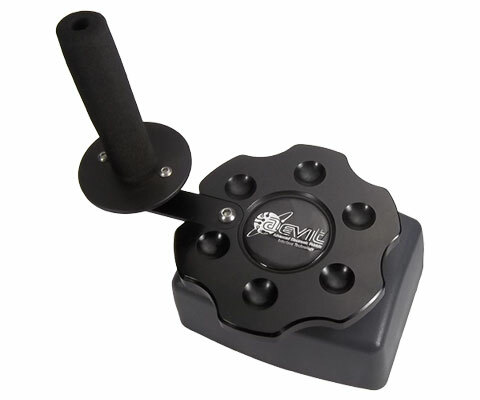 The exposed height of the joystick is approximately 4.25” and an angular displacement, or range, of only 50 degrees is required to move the input from the full gas position to full brake. The mechanism is extremely low-effort, requiring a maximum input force of only 0.2 lbs, and is internally spring loaded to return to the center, or null, position. 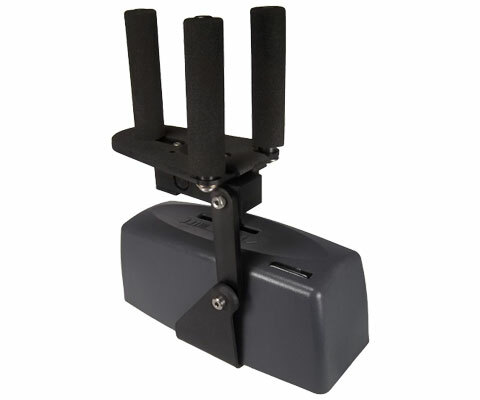 The W-Series is a Steering only system that utilizes a miniature 5″ diameter wheel input device, and is the favorite amongst 2-handed drivers for ease of use. The total number of rotations from full left steer to full right steer is 5-6.7 turns depending upon the vehicle. This equates to an approximate 2:1 ratio between the W-Series input device and the OEM steering wheel. The input force required to turn the wheel is approx. 0.2 lbs. as measured at the proper orthotic position of 3.4″ from center. 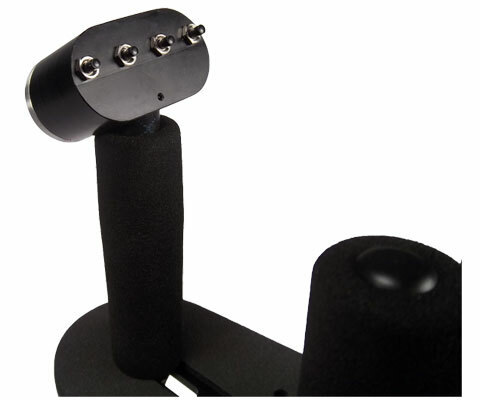 Is a Steering only system that utilizes a single axis joystick input device. 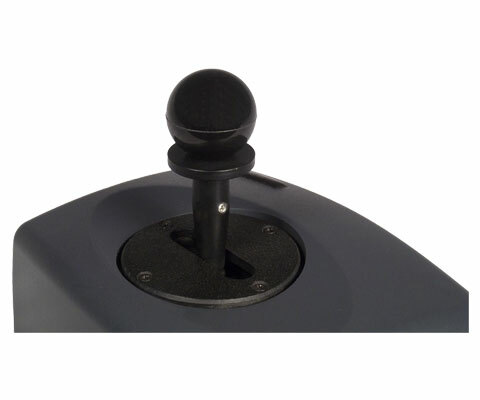 The exposed height of the joystick is approximately 4.25” and an angular displacement, or range, of only 50 degrees is required to move the input from the full left steer position to full right. The mechanism is extremely low-effort, requiring a maximum input force of only 0.2 lbs, and is internally spring-loaded to return to the center, or null, position. 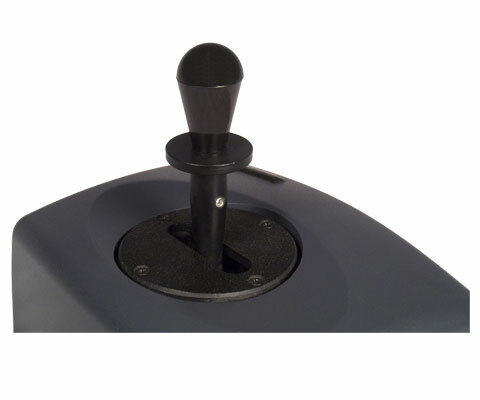 The joystick is coupled internally to 3-independent and redundant electronic devices for unsurpassed safety and reliability. AEVIT 2.0® Secondary Control Options enable you to tailor the controls to your wants, needs and to your budget. 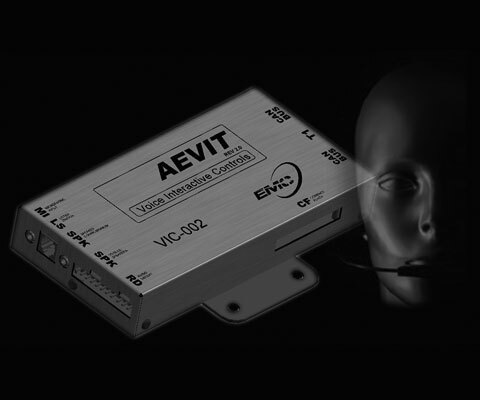 Of course, if your wants, needs, or budgets change in the future, adding more functions and features to your AEVIT 2.0® system is as easy as inserting a new compact flash card. If you have access to a cellular device or satellite network with data capabilities, EMC Service can connect to your AEVIT 2.0® via the internet to perform these updates! This most popular option allows instant access at the touch of a screen, to almost every electrical function that would be required in an adapted motor vehicle. 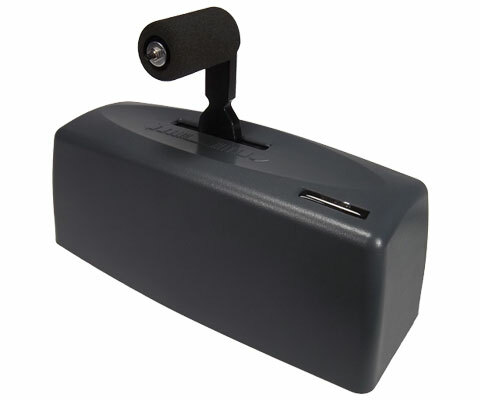 The activation of all functions listed is standard equipment, including Shift and Park Brake actuators. This option costs less but still allows access to many standard electrical functions that would be required in an adapted motor vehicle. The activation of all functions displayed below is standard equipment, including a Park Brake actuator. 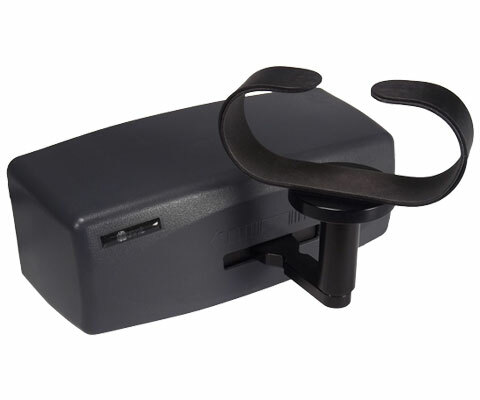 This is the least expensive option but still allows access to many basic electrical functions that would be required in an adapted motor vehicle. The activation of all functions displayed below is standard equipment, including a Park Brake actuator. The Secondary Driving Controls manufactured by EMC are designed to operate vehicle functions other than Gas, Brake & Steering. EMC offers a variety of options for many different vehicle applications. 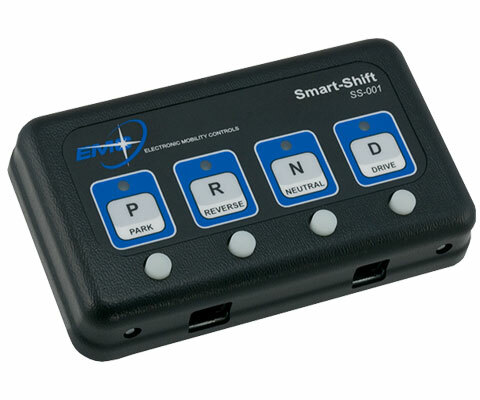 Smart-Shift® sets the industry standard for “Electronic Shift” applications, and can be installed into any vehicle equipped with an automatic transmission. 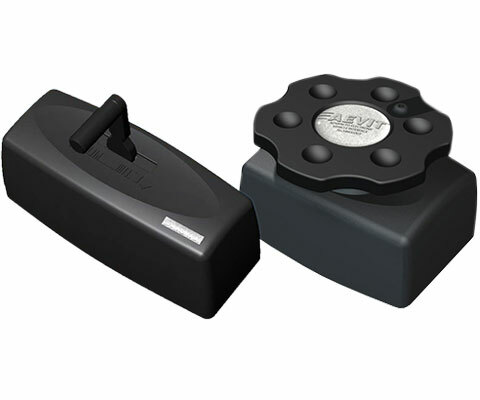 No more missed gears or waiting in traffic for other actuator systems to slowly move. Smart-Shift® travels from Park to Drive in 1.3 seconds! 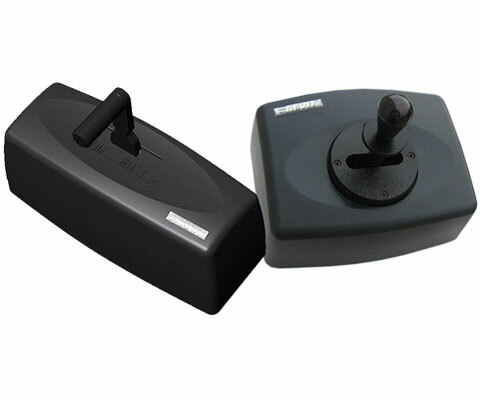 Simply press the desired key one time and the actuator moves to the desired gear automatically. 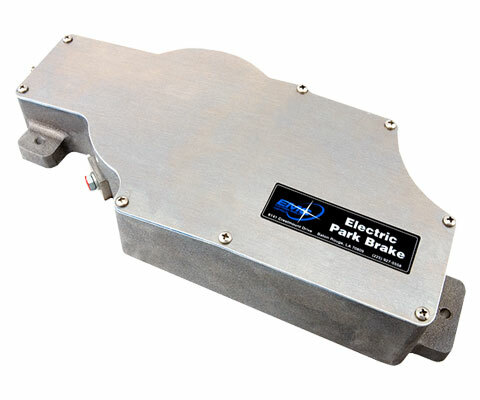 The EMC Electronic Park Brake is an excellent and dependable replacement for the OEM mechanical Park Brake. 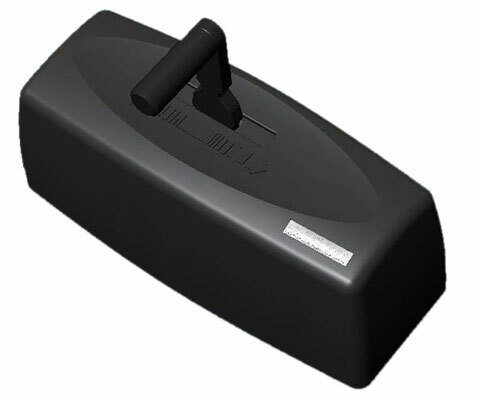 The Park Brake utilizes a combination of components which can output a force of more than 640 lbs. and is capable of fully applying the park brake in less than 3-seconds. The water resistant cast housing is designed to keep the internal components protected from the elements and abuse. This “new” technology from EMC replaces the older Digivoice® “voice activation” systems from EMC. 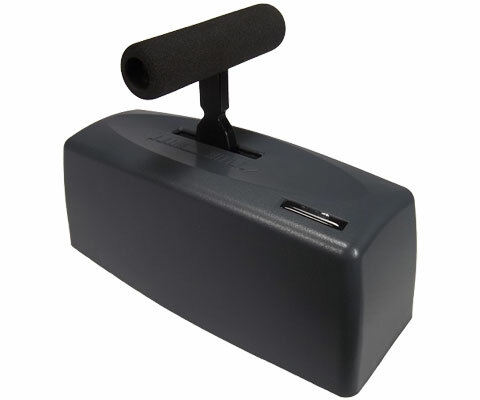 VIC® stands for Voice Interactive Controls and is used for “voice activation” of Secondary controls, and is also used to communicate “verbal instructions” to the driver on the status of AEVIT 2.0® primary driving controls. VIC® incorporates a programmable “flash card” reader enabling speech commands and instructions to be “custom tailored” if needed. 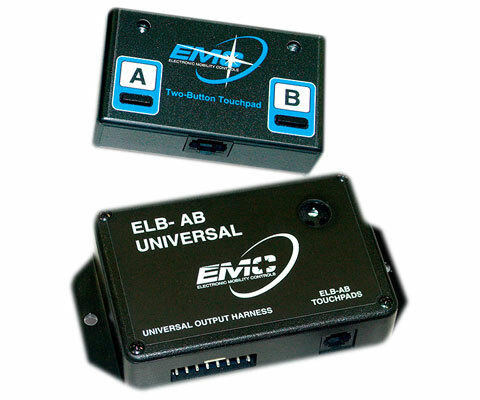 The EMC line of Two-Button Touchpads is the economic solution for persons requiring simplified access to a minimal number of vehicle functions. 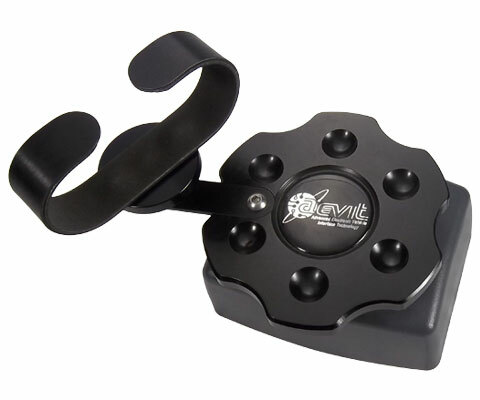 These touchpads are constructed of lightweight and durable ABS plastic and can be mounted just about anywhere, including directly to a hand control device. Each touchpad incorporates two, low-effort switches spaced 2.3 inches apart for easy access. With the addition of raised buttons, the touchpad becomes extremely tactile so that access for persons choosing elbow operation is simple. Call a Mobility Specialist at 877-501-8267 and let United Access help you find the right EMC Driving Aid to best suit your mobility needs.